You, Me and Movies: Chifilmfest Review: "Last Flag Flying" feels like an actors runway. Chifilmfest Review: "Last Flag Flying" feels like an actors runway. If I had to name one of my favorite filmmakers, it would be Richard Linklater. In 2014, I declared “Boyhood” as the best film of that year, and it’s a film that stuck with me ever since I saw it. I own it now, and every time I watch it, it hits me in a different way. I feel I get something new out of it every time I watch. His “Before trilogy” is one of the finest trilogies in cinematic history, which is saying something since it’s a series of romance movies. “Dazed and Confused” is an absolute blast every time I watch it, as is “Everybody Wants Some! !” Linklater’s signature is how he plays with time, almost making it a character in each of his films. How it affects us, how it makes us happy, or sad, or a little of both. Time is a funny thing, and it is never ignored in any of his movies. Linklater has been political before, but never like he has been with “Last Flag Flying,” his new film starring Bryan Cranston, Steve Carrell and Lawrence Fishburne. Following three Vietnam vets who were all close to each other during the war, but fell out of touch in the years that followed. In 2003, when our country was deep into war with Iraq, Doc (Carrell) finds Salvatore (Cranston) who now runs a bar in Philadelphia. They talk all night, catch up, then Doc asks Sal to join him on a quick road trip. 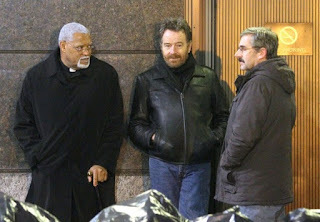 Sal doesn’t realize that Doc is taking him to see Mueller (Fishburne) who was a bit of a roughneck in Vietnam, but now has settled down and become a man of the collar, a preacher with his own church. The three friends quickly catch up, and then soon enough Doc presents the reason why he has chosen to reconnect with these two men after so much time. Doc’s son became a Marine and he was killed in action in Iraq. He is asking Sal and Mueller to accompany him to Arlington where his son will be buried. The men decide to agree, and its off on a road trip they go to help their old friend. When they get there though, it seems that the military is not being as truthful about Doc’s son’s death, and Doc decides to move the body to his hometown where he plans to bury his son on his own, Sal and Mueller accompany him. What ensues is an enlightening, insightful and hilarious road trip between three men catching up. This movie may not play with time the way Linklater’s films usually do, but it’s clear time and how it changes people and places definitely plays a role in this film, affecting the characters exponentially. If Bryan Cranston’s performance doesn’t put in awards season this winter, then we are clearly in for a phenomenal year of performances ahead of us. Cranston pretty much began his career being a funny guy, I remember him from “Malcolm in the Middle” on TV, the first thing I ever saw him in. It wasn’t until later in his career when he started taking dramatic roles, but Cranston proves here that he can merrily do both. Every time Cranston is on screen, he’s saying something funny. If you needed a undeniable reason to see this movie, just watching Bryan Cranston do his thing is merit enough to check this out in a theater. I hope that’s saying something, since both Carrell and Fishburne are both equally great here. We’ve seen Carrell play these types of people before, these sad, broken men of few words. But somehow, he makes every new role he plays so special that it feels different every time we see him. Doc is nothing like any other character Carrell has ever played, and that’s essential. Fishburne is just wonderful, no other words are needed. There is one more performance of note that I need to say something about. An actor named J. Quinton Johnson plays Washington, the best friend of Doc’s deceased son who was present when his son died. Washington also spills the beans to Doc on what really happened to his son in the line of duty. J. Quinton Johnson is a real discovery here. Someone who I wouldn’t be surprised we begin seeing in lots of other films in the near future, once everyone else gets a chance to take a look at this thing. I will admit something, I don’t think “Last Flag Flying” hit me as hard as Linklater’s other films. I have been thinking about it for an entire day, and I don’t think it’s nearly as good as the other films he’s made in his career. But I am definitely not saying that it’s bad. There is much to love and to be entertained by here. I want to see it again simply to watch these three titan actors bounce off each other again. In a movie about secrets, there is something from the men’s Vietnam past that resurfaces when they meet, and I am not sure if that arc really concludes. I also don’t know if the movie needed to be over two hours. But again, there is so much good here that outweighs the flaws. Which is always important. "Last Flag Flying" will be released wide in the United States on November 3rd.